Learn more about the history of our practice & meet our caring, dedicated team. We have stayed true to our traditional values and continue to maintain the feel of friendly, family owned, community practice, situated at the lovely location of Ledger Farm. Our highly qualified team will provide exceptional care for your pets. We all have pets ourselves and will look after yours as though our own. We’re excited to announce we’re doing our bit to look after the environment. Our caring, passionate team of veterinarians, nurses and support staff have years of experience – ensuring your pet is always in great hands. Hi, I’m Simon (we’re all on first name terms here!). I took over the running of Kelperland in May 2014. I’m a dairy farmer’s son from Cheshire, and have wanted to be a vet as long as I can remember. There was always a menagerie of animals on the farm – cats, dogs, cows, pigs, chickens, turkeys, horses and sheep. Our local vet was therefore a constant presence at home and I became fascinated with his work; caring for animals and helping them to stay out of pain, what job could be more important? When I was 14 I spent a week in our vet’s car travelling around the area and seeing cases….I was hooked! And have been ever since! I went University in Liverpool and graduated in 2005. I then spent 7 years at two large veterinary hospitals in the North West, with 2 years working at various veterinary clinics in London sandwiched in between. My main clinical interest is surgery, especially orthopaedics (bones and joints). 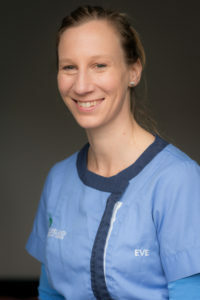 I am recognised by the RCVS (the veterinary governing body in the UK) as an “Advanced Practitioner in General Small Animal Surgery,” which reflects the level of my post graduate training and experience. I just love being a general practitioner – getting to know clients and their pets, working together to keep our furry friends happy and healthy! I am hugely proud to have been nominated for the Petplan Vet of the Year awards in 2015, 2016, 2017 and 2018! I live with my wife Camilla and our baby daughter, Elana, born April 2016 (super cute!). We have a little rescue terrier cross called Ruby…she’s adorable inside the house, a real snuggler, but a true terrier outside, sniffing everything and pulling on the lead! We only live around the corner from the practice so I love nothing more than popping home at lunchtime for a family walk in the nearby fields. Hello everyone, I’m Eve. I’ve been working here at Kelperland since June 2015. I’m from New Zealand and was brought up on a sheep and beef farm in the North Island, where I enjoyed working with all sorts of animals and riding my horse around the farm! Much like Simon, we always had the vet around and it was easy to become fascinated in this job! 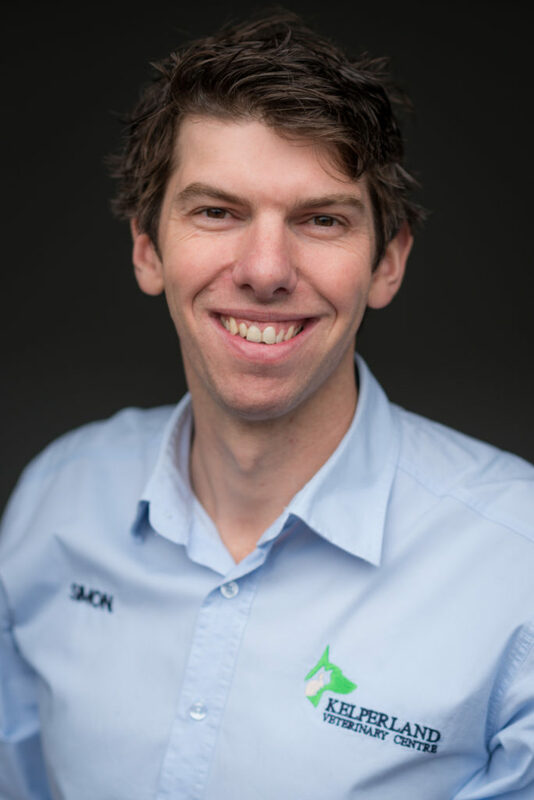 I graduated from Massey University in 2003 and spent a couple of years working with all sorts of different animals, before focusing on dogs and cats whilst working in the UK. 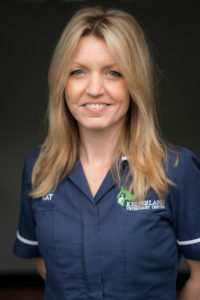 I’m currently studying towards a further postgraduate qualification in dog and cat medicine, which is hard work and time consuming, but great to be learning all the most up to date treatments, helping us provide the best care for all our patients here. Outside of work I play Hockey most Saturdays for a team in central London. I also love cycle-touring and playing tennis. My partner and I have a little Cocker Spaniel, Bella, whom we adore of course. 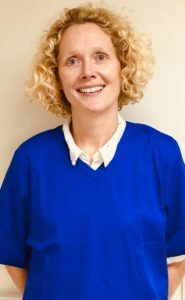 Hello, I’m Fiona and I have just joined the Kelperland team in September 2018. Since graduating from Liverpool University in 2000 I have worked in Morocco, Devon and Herefordshire but I’ve been treating the pets of Berkshire in various clinics since 2003. I thoroughly enjoy all the many aspects that make up our role at veterinary surgeons, and relish the variety that any working day can bring. I’m really looking forward to getting to know the team here, and all the clients and their much loved pets. I also practice acupuncture on our patients as a complement to our other services. I live (very) locally with our young family, the youngest 2 of whom have just started school, hopefully giving me lots of “free time” to enjoy other hobbies and relaxing outside work! Camilla is an experienced biology teacher but has put that on hold for a while whilst she has been managing business aspects of Kelperland since taking over the practice in 2014. 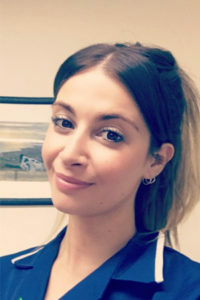 Her time has been divided since the birth of her daughter, Elana, in April 2016 but she is still heavily involved behind the scenes, helping things to run smoothly. Camilla also loves spending time with the family dog, Ruby, and has adored seeing Elana and Ruby become partners in crime around the house! 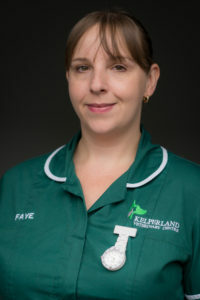 Faye is a qualified veterinary nurse who has been with us at Kelperland since 2006. She has 5 cats each with their own unique personalities, Spikey who is 13, Frank, 12, Stanley, 9, Hank, 5, and Dale, the newest arrival, who’s a year old! She calls them ‘her little misfits’ as they all have special quirks! They are all strays which she has picked up at various stages along the way. When not working Faye’s hobbies include helping out as an official with the local roller derby team and going to concerts with her husband. She enjoys a wide range of music with her favourites being country, southern rock and rockabilly to name a few. Faye also enjoys baking for friends and family and has won awards for her cupcakes! Lotte has worked Kelperland since 2001. 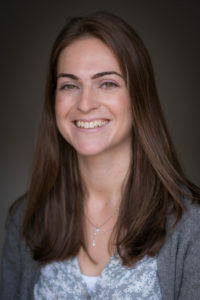 She has been a loyal assistant to Mr Cooke throughout the years and knows most of the clients on first name terms. She has two bulldogs, Yogi and Huey, whom she adores! She also has a cat called Jack who is a free spirit and likes to roam outside. Outside of work she loves shopping for retro furniture and doing crafts at home such as sewing, painting and card making. Hi, I’m Kerry. 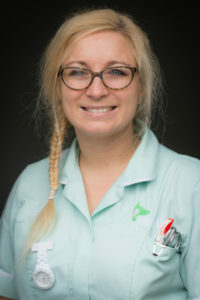 I joined the team as a veterinary nurse in February 2018. 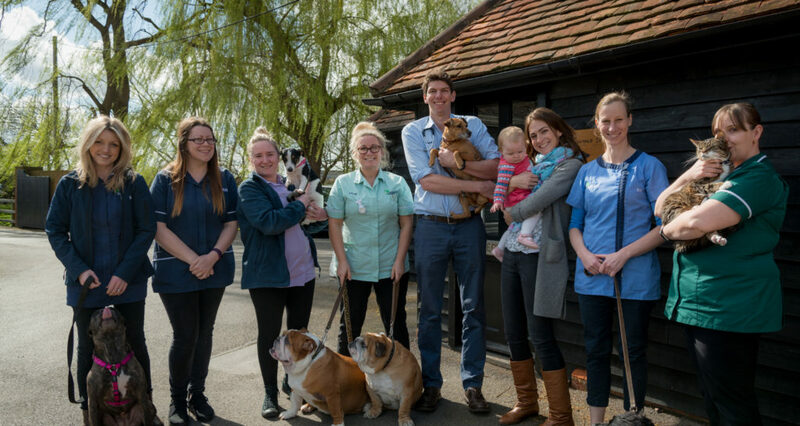 I qualified as a veterinary nurse in 2016 and have worked at a couple of other practices around Berkshire. I have a habit of adopting creatures, I currently have 2 beautiful Yorkies called Logan and Toby and 4 guinea pigs. I have an interest in medical cases and nursing small furries. I would like to get more involved with canine behaviour and physiotherapy. In my spare time, I like to go exploring with the dogs, visiting my home town of Brighton to catch up with friends and family, spending time with my fiancee, eating out and travelling to new holiday destinations. Kat loves her rescued Staffie cross called Tig and has another child with just two legs! Her spare time is spent walking one and watching the other play football! 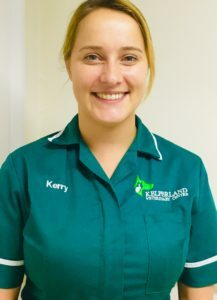 Kat joined the Kelperland team in September 2015 and loves snapping pictures of all your cute pets for our Facebook page…. you have been warned! Hello, pleasure to meet you all, I’m Emily the new afternoon/evening receptionist here at Kelperland. Aside from being (particularly) dog & cat crazy, and in turn also being very broody for one myself(!) I also enjoy going for long walks along the river and exploring the local area. I love a good story and new scenic exploration areas, so please do come in and feel free to tell me all about your pets and where you might like to take them! Kelperland Veterinary Centre first opened in 1958 and has grown from strength to strength ever since. Since taking over the practice, we have reinvested heavily in modern equipment, such as digital x-ray, a dental machine and blood machines. We are taking the practice forward into the next act, incorporating modern medicine and techniques, whilst staying true to our values that have made us so successful. 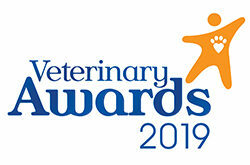 We’re delighted that all of our hard work appears to be paying off – the practice has been nominated for “Vet Practice of the Year” in the prestigious PetPlan awards in 2015, 2016, 2017 and 2018.